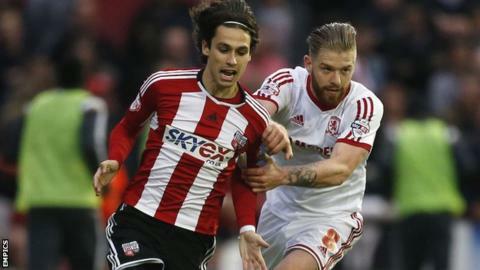 Brentford forward Jota will be out for at least three months after having surgery on an ankle injury. The 24-year-old Spaniard damaged ankle ligaments in the 2-2 draw with Ipswich on the opening day of the season. Jota, who scored 11 goals in 46 appearances for the Bees last season after joining from Celta Vigo, had an operation on his ankle on Tuesday. "Looking forward to recovering as soon as possible and come back stronger than ever," he tweeted. Jota joins a lengthening injury list at Griffin Park, with defender Andreas Bjelland likely to miss the whole campaign with a serious knee injury and striker Scott Hogan (knee) also a long-term absentee. Summer signing Josh McEachran suffered a foot injury in pre-season training and will be out for another two months, while Lewis Macleod, who has not featured since joining the Bees in January, is expected to return to full training next month after hamstring trouble.